Here I will show you how to cook corn on the cob using a microwave. When you use a microwave to cook a whole ear of corn, all the flavors become concentrated inside. This makes the corn taste extremely delicious. By the way, after it has been cooked, all you need to do is cut the base off, and the husk and silk will come off really easily. This is a method of heating corn with a microwave. Place an ear of corn on a plate. Cook it in a microwave (500w) for five minutes, just as it is, without covering it with Plastic wrap. Cut the base off, at around 2cm above the bottom with the stalk and leaves (please refer to the photo above to see where to make the cut). Hold the silk and shake the ear of corn. The inside should slip out easily. 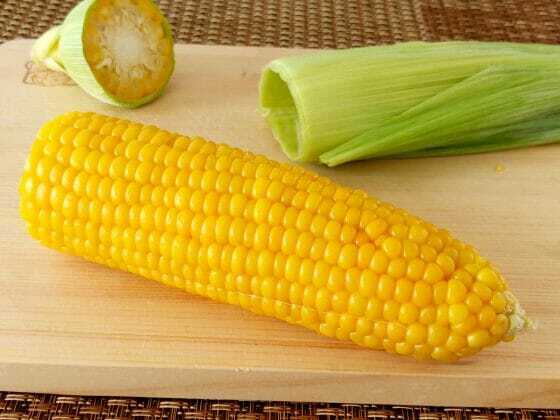 Your corn on the cob is now ready. 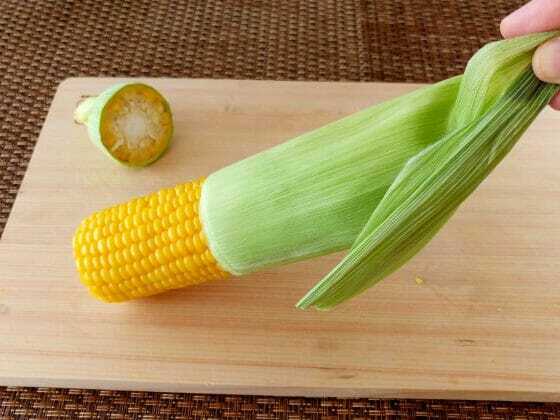 After cutting the base of the ear of corn, hold the silk and shake it. This should cause the inside to slip out of the husk really easily. It may seem like a waste to cut off the kernels at the bottom. However, cutting off the thickest part makes it much easier to extract the inside of the corn. 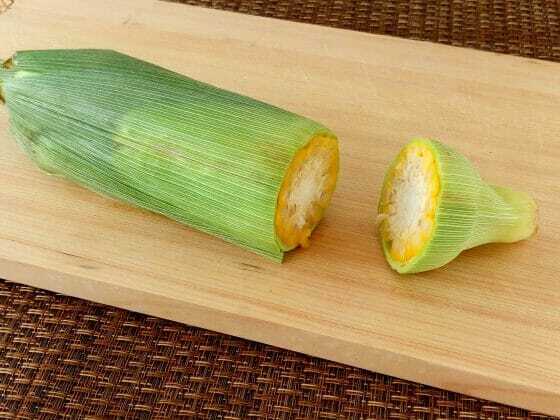 If the inside of the corn does not come out easily, cut a vertical line on the husk at the bottom, and open it up. The husk should peel off a lot more easily than when handling raw corn. Cooking corn in a microwave is definitely much more delicious than boiling it. Boiling corn causes all the nutrients and flavors to dissolve into the water, making it taste a bit watery. However, with a microwave, all the flavors and nutrients are kept inside, making it much more delicious. Also, cooking corn using a microwave is a lot easier than boiling it.